After a week of Nintendo Wii overindulgence, a bit of a ramble. The Wii itself. Tiny! I mistook it for an external hard drive at first: “Is that really it?”. It’s a small, flat white box with a slot at the front for discs. There’s buttons for eject, reset and power, and the slot lights up when a disc goes in. The sockets in the back are sensibly positioned, and there’s also a USB input; plus, a concealed slot at the front for SD cards from digital cameras. The packaging in the box is also very un-console like. As Frans in Tampere noted when his arrived, it contains lots of little compartments with various things in them. Overall, there is a distinctly Apple-Mac style to the whole system, with everything being streamlined, white, with soft corners and hidden sockets and wires. Maybe that’s accidental, maybe deliberate, maybe (suspect strongly) it’s a statement that this is not a huge, testosterone-fuelled souped-up Microsoft-Sony powerbox, but something very different. The controllers in motion. The controllers are a neat piece of kit, containing no doubt some bedevilling electronic circuitry. Put your hand through the strap and hold it. There’s various buttons on the front, and one button-pseudo-trigger on the back. The controller is quite light in the hand, with the weight increasing noticeably when batteries were inserted. However, thankfully, even after 9 hours of constant Wii play, the controller never started to feel heavy. the motion is transferred immediately to the game. Swing the bat in baseball, and see it swing on the screen. No discernable lag (which was my main concern before playing the Wii). in some games, you can plug in a different controller, the nunchuck, which is held in your other hand. This offers extra functionality e.g. move your character with the nunchuck, while targetting your opponent with the other. the controller detects motion in any and every direction. Up, down, left, right, back and forth, sweep to the left or right, and so on. Games such as Laser Hockey and Table Tennis show that the speed of the motion also makes a difference. Mii creation. Miis are little characters that you create, to be used in Wii games. The editor is simple to use but surprisingly powerful, enabling you to draw recognisable representations of people’s heads. You can either start “from scratch”, or take a head from a gallery and adapt it. There are now 14 Miis stored within my Wii, each based on a person on the island I live on. Librarians in particular have been adept at creating Mii representations of themselves and sharing them. One of the most exciting things for me about the Wii and it’s Mii characters is the ability to leave your Wii on and connected to the internet. You can set your Miis to “Mingle” and they’ll wander off and visit your friend’s consoles! When you’ve got some Wiis, you can do various things within the Mii creation centre, such as arranging them in a variety of ways, making them line up or run around. 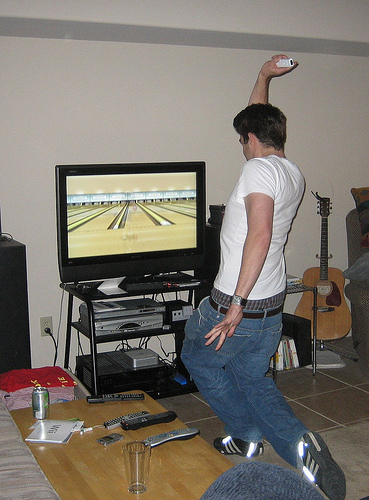 Wii Sports. Comes with the console; five games plus training and fitness options. You have to stand up for all of these. Unfortunately, there may be a flaw in the game, as one of the locals achieved a high score (three strikes in a row at one point, called a “Strike Turkey”) merely by hurling the ball in almost a cartwheel motion. [Update: no-one here has yet managed four strikes in a row, despite many people trying this over the last few weeks.] We’ll be carrying out more tests to see if she fluked it. For the rest of us, scores were close, and figuring out turn and spin are involving activities. This is fairly physical, but unlike boxing you can play several games in a row without the need for a lie-down and a cup of tea. Tennis. A likeable game, much better in multiplayer mode than in single player mode. You serve, and can do backhand and normal returns, plus other things we haven’t yet figured. Note: you don’t do the running about – your Mii does that for you on the screen. You just stand there and serve and/or return. We haven’t tried four player mode in this, but suspect that it’ll be a bit chaotic; we may need to do some furniture rearranging first so everyone has enough room to swing their racket/controller without decking an opponent. Golf. I dislike golf in the real world for a whole load of reasons and cannot bring myself to play this with any enthusiasm. Ask Tiger for a review. Baseball. This was good. 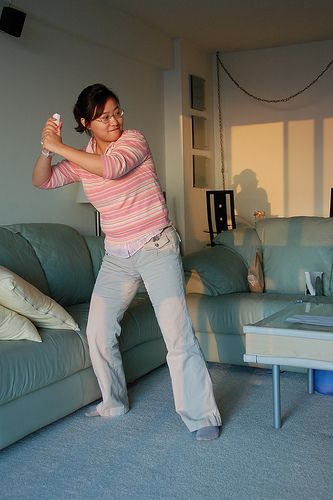 You alternate between pitching and batting, holding the bat and throwing the ball as you would in the game. The running and catching is done for you. Single player mode and two player mode available; in the latter, one player pitches for a bit while the other bats, then they swap over. However, as the game went on, my arms got progressively more tired. Batting is a good demonstrator of the response of the game to the motion of the controller. Training. Ah, this is good. For each of the five sports, you are presented with three differents kinds of task. For example, with bowling, you have to bowl around an increasingly difficult set of obstacles; with golf, you have to hit the ball onto a target area (which made that game at least slightly interesting). Boxing was, as with the game, very strenuous, involving a workout with a punchbag, and also hitting your training partners pads without hitting the partner himself. Fitness. The session picks three training routines at random for you to do. Similar to Brain Age on the DS, you are awarded a fitness age (mine is currently 25, which as a 38 year old I am very happy at), based on criteria such as balance and stamina. Wii Play. Nine games; you can sit down for all of these. All the games have 1 or 2 player modes. The disc comes with a controller; as it adds just five pounds to the price of the controller on its own, it’s a no-brainer to buy this. Non of the games have long-term appeal i.e. you won’t play them every day for a year, but there should be a few in there that you’ll like and keep coming back to. They also serve as an excellent introduction to using the controller. Though these are all simple games, visually (especially cow racing and fishing) they are often very imaginative in design. Shooting Range. Shoot at balloons, clay pigeons, and flying ducks. Fire at cans to keep them in the air. All very fairground like, and a pleasant introduction to this set of games. As it progresses, you find yourself having to shoot UFOs which are trying to abduct Miis hiding in the long grass. Good in both single and multiplayer mode; this game has obvious positive cognitive benefits e.g. pattern matching, search strategies, memory workout. 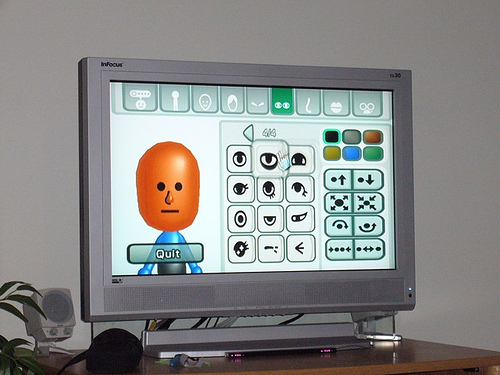 It also helps tremendously if you’ve created some Miis before playing this game, as those will be easier for you to recognise as opposed to the computer-generated ones. Table Tennis. Not sure about this. Very little movement of the controller required. One player mode was dull e.g. have a rally of 100 hits which get increasingly quicker. The game also is a little odd to watch, as the hands and bats are disembodied from the rest of the player. Pose Mii. Bubbles fall from the sky with the outline of your Mii – in a particular pose – in them. Twist the controller to line up your Mii to fit the outline in the bubble, and press the button to get the matching pose. Didn’t grab me, possibly as I find twisting the controller clockwise or anti-clockwise the least natural (or most self-aware) of the movements possible. Laser Hockey. Basically like the air hockey machines in arcades, but with a neon lit game area and controls. A simple game, the sound effects of which are a bit like Chu Chu Rocket on the Dreamcast. Most goals tend to be own-goals, with you or the console player accidentally knocking the ball back into your goal. Using the ends of your paddle to knock the puck back is a useful tactic for worrying the opponent. Looks both retro, and cleaned up and refined. A good game for post-party chilling out. Billiards. A dull remake of various pool and billiards simulations, with plodding lounge music in the background. Topspin, backspin, select the direction, the usual. The one innovation is that the controller is the cue. Pull back on it and the cue pulls back on the screen; push it forward to hit the cue ball. Okay if you like this genre of game, but otherwise has little to offer. Fishing. Not too keen on playing this myself, but others here really liked it. There’s a fishing pond (excellently drawn in a cardboard cartoon-style) with some fish in it. Cast, move the float around, pull out a fish that’s biting. Avoid the small fish (minus points) and aim for the bonus fish of the moment (double points). Similar to Sega Bass Fishing on the Dreamcast, but in a much more simplified way. The cows, the road, the grass, the sky and clouds; all knitted. From a visual point of view, brilliantly imaginative; one of those things you get only from Nintendo and Sega at their best. In two player mode, it can get hectic (you can make the cows rear up, and knock each other). Possibly the best game in Wii Play; worthy of expansion, with new courses, more cows, more sound effects, and possibly the odd weapon (cow pat?) into a full game. Tanks! Move your miniature tank around a landscape, avoiding the shells and missiles from other tanks while blowing them up with shells and mines. It’s an isometric view, with a neat laminate flooring effect for the playing area. This can be played with the controller alone, or with the nunchuck added on (easier). I quite enjoy this, as it has a good rate of difficulty increase. Zelda: Twilight Princess. Yes, it looks great. The controls work fine, and very quickly I was fishing, running, jumping, riding a horse, calling a bird of prey and getting him/her/it to retrieve a cradle, and doing all manner of other things. Very enjoyable. And the nostalgia is strong. I was an Ocarina of Time player, and spent much (far too much) of two months having fun with that particular game. When you start Zelda: Twilight princess, you immediately hear some of the music from that game. Other elements of the game immediately, and deliberately remind you of Ocarina. The reviews are universally good. And the area to explore, do things in, and solve puzzles in to progress, looks huge. But this is my personal problem. The game obviously demands a very large time commitment, which I don’t have to give (unless I can find some research funding that is based around playing Zelda for a few months). I could (try and) restrict myself to bite-sized chunks of the game, and spin it out over a year, but will that have the same degree of satisfaction as playing it for a significant part of each day ? And also; is the balance tipped too much towards the nostalgia of Ocarina as opposed to being a new and fresh title? So, for me, a dilemma, and Zelda stays in its box for now. For other people – if you have the time commitment, and you haven’t played Ocarina of Time, then it’s a strong “buy”. Should you buy the Wii? Look, it’s cheap compared to the other consoles of this emerging generation. The fun per pound/dollar ratio therefore looks very good. If you have a group of people – of any age or demographic – you’ve got a much higher chance of everyone having a go than for most social activities. Think your grandparents or great-grandparents won’t be interested, or can’t play it? Wrong. Buy one; buy a copy of Wii Play (which comes with a controller) and two more controllers and a nunchuck. And a battery recharger with batteries (see next point). That’s still pretty cheap overall, and you have all the kit for up to 4 people to play at the same time, plus 14 games in total to work through. A few other notes. Battery life. The controllers use two AA batteries each, and chew through them quickly when the Wii is turned on. Battery life lasts about 30 hours for the ones provided, so when the Wii is not being used, make sure it is turned off (especially if you are using multiple controllers). Even better, get a recharger that can take multiple batteries; otherwise, you may be spending more on batteries than games. I haven’t touched on the Internet functionality yet, as I haven’t plugged it online. Am intrigued by this, especially the concept of letting my Miis wander off into other people’s Wii console areas. For another day. We also haven’t used the Photo Centre. This is where you can view photo’s (and possibly do other things), which you can load in through the SD card port concealed on the front of the Wii. And if that’s not big enough, it turns out to be relatively easy to do your own Wii sensor set-up; some guys have developed their own sensor bar (cost: 20 dollars) so they can play the Wii on a 344 inch cinema screen. Game interface design; how it differs between traditional games and those playable through motion-actions. 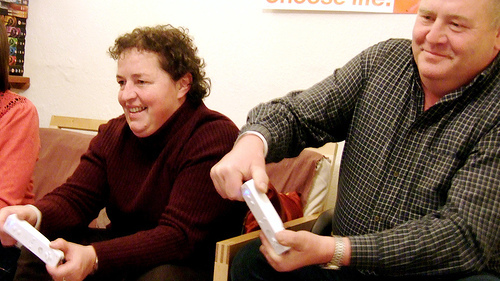 First encounters with video games – using motion-input games – by elderly, non-playing or anti-games people. How do they get on? Is their gameplay helped by full instruction and training, as opposed to being left to figure it all out? How gameplayer correlate the real physical motions they do to the onscreen action (but, taking this beyond previous overdone “hand-eye coordination” studies). How gameplayers physically react to onscreen visual, offscreen visual (other players), and audio cues. For example, with the tennis game (which requires only hitting the ball and not running around), why do some people just hit the ball but others go into a “mimic” frame of mind and start (unnecessarily) running around the room as if playing real tennis? And note the previous “cow milking” picture, observing how players often gradually crouch in towards the screen, perhaps in some kind of subconcious hope this give them an edge. …affected by the motion-nature of Wii gameplay, as opposed to old-style button-pressing sedentary gameplay? Keyboard replacement: how far can motion-based controllers be taken in replacing the keyboard (and other methods of input) in game play and serious data entry? 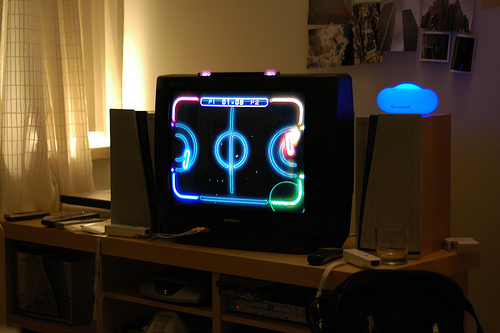 Combining the motion-centric Wii with different kinds of visual display. There are a couple of intriguing pictures that someone has put on Flickr of their daughter apparently playing the Wii while wearing the Icuiti headset. This simulates having a “floating 42 inch widescreen TV” permanently in front of you. So to summarise; that’s a gaming session with no television and using wireless motion controls – plus, the Icuiti removes the restriction of facing a fixed tv screen all the time. So if the Icuiti came down in price and lived up to it’s publicity, this could become an intriguing combination? 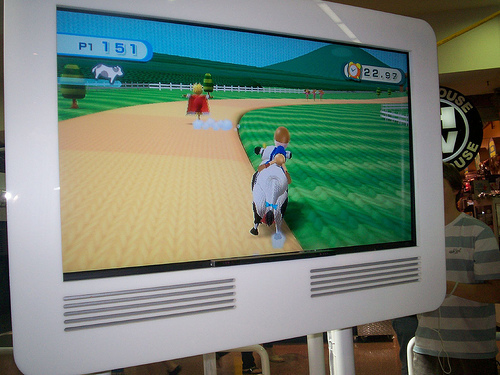 Using Wii technology on other computing or gaming platforms. Judging from the number of “I made this” videos on YouTube, this looks relatively easy; for example, here a video of someone explaining how his Wii controller now functions for the game World of Warcraft. Character representation and recognition as Miis; there’s some applications in there for the psychology crowd. Mii culture. It’ll be interesting to see what people do with their Miis, especially as they can be “let loose” online and roam into other peoples Wiis. Operating other stuff using the Wii remote. Seems like there is a constant stream of websites and videos where people have worked out how to program the controller to do something else, such as operating a vacuum cleaner. So what else, of use, can be more effectively controlled using Wii hardware? Cardiovascular benefits from playing games demanding physical response and control. It looks like Nintendo may be actively developing some games with this in mind. 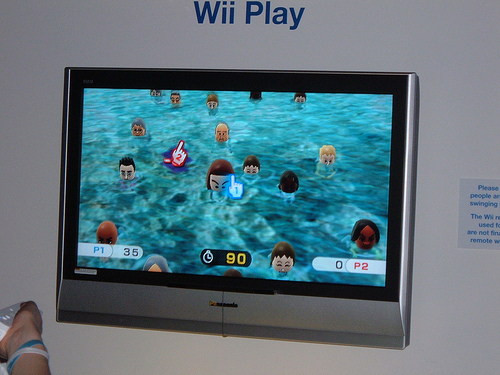 Mental, memory and cognitive stimulation through games such as Find Mii. 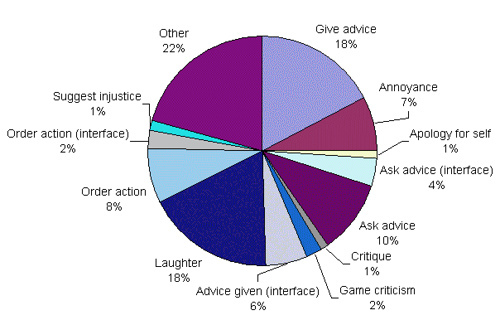 Gaming as pain management, or a distraction from pain and discomfort. There’s been some research on this previously; the physical nature of Wii games opens up more research possibilities. Because of the inspiring and thought-provoking nature of the games and gameplay, it’s an absolute must-get for any decent games research centre or group. If, in a few months time, an academic games research centre doesn’t have a Wii in a communal staff area, then it is questionable how serious they really are about video games and gameplay. Library potential. Yes, it is suitable for use in a public library. 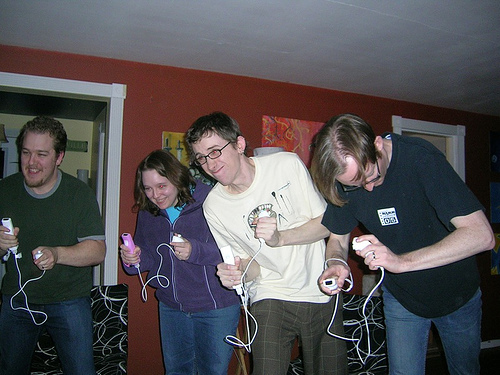 The games are okay for people of all ages; the motion aspects of the game mean that it negates the criticism of gameplay being a sedentary activity. The games are very pro-social in nature, almost willing you to try them in multiplayer, as opposed to single player mode. 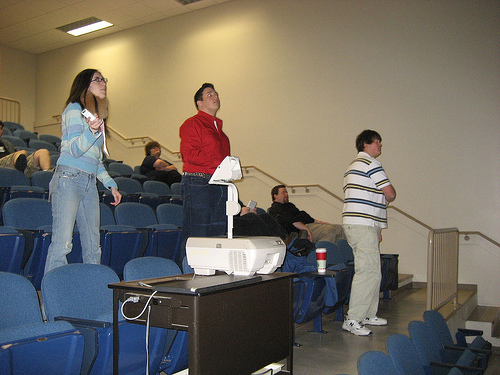 Also, spectators get a lot more fun out of watching people play Wii games than last-generation button pushing titles. The difference now is that you aren’t just watching a game on a tv screen, you are watching real people playing a game that is also represented on a tv screen. Some libraries are moving quickly on this. The Carnegie Library of Pittsburg acquired a Wii at launch and are using it heavily, as has a public library in North Carolina, while the Rochester Hills Public Library lend out Wii games. A few words of caution, though. You’ll need a fair bit of space for this activity, especially for four-player games. Also, Wii gameplay, I suspect, is louder than games being played on other consoles – the noise coming from players and spectators. It’s been pretty loud here with a few people playing and watching. The distraction of motion may also cause a problem in some libraries where that isn’t the “done thing”. But maybe that’s a good thing. There’s also an increased danger of equipment being damaged by people who don’t use the strap, but this isn’t a problem with anyone who sensibly “straps up”. For libraries: there’s no question. If you’ve got a suitable corner where there’s not a problem if it’s a bit noisy, a tv and a couple of hundred pounds, then go for it. Future potential. 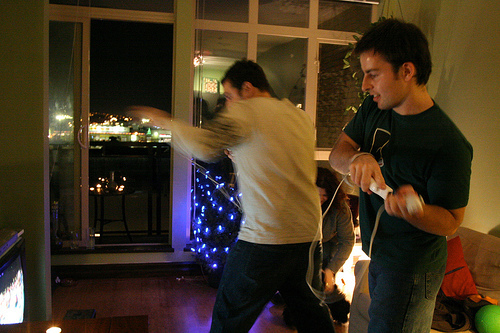 It didn’t take long for people to start using the Wii in ways Nintendo hadn’t intended, or even thought about. Making it web-compatible using the Opera browser was a start, as it means that Flash-based applications can be run through the Wii. And so, if you search around the web, you’ll find an instant army of teccies, building Wii-centric stuff. Here’s one example; someone who controls the lighting, heating, security and other house-based functions through his Wii. Final word: for Nintendo. Kudos for providing a system that is genuinely fun to use, and makes people who have never been interested in games (or even repelled by them) want to “have a go”. Now, please: more innovative, quirky, offbeat and unusual games that make good use of the controllers; and also a few that can tap into wireless DS use, so verbal input can be used. It’s interesting to listen to that video, and identify the various tunes and sounds (e.g. 3:17) which Nintendo have carried through into many future Zelda games. Influential? Very. No Legend of Zelda, no … rather a lot of gaming things, not just Zelda or Nintendo-associated. The Wikipedia page has a good run down of the impact and legacy of this particular game. Happy birthday, Link and Zelda.